in the afternoon. It was a big affair, but the heat was fearful. I did not feel well most of the day. It was Ediths 16th birthday and they were to have a supper but we could not stay. I got our supper after we come home. Saturday July 31st 1897 I was not able to get up this morning. Will did the chores and went up and got John Stevens to go after Mother. She came about eleven oclock and got some dinner for Will He went to town after dinner to get Ohio coal to thresh with next week. John Garrett came back with him. I got up about six oclock. It has been a warm day. Sunday August 1st 1897 I felt better this morning and helped Mother with the work. Tishie & Charlie with the children and John & Hattie were here for dinner and supper both. We had a good visit and got all the comfort out of it the extreme heat would let us. Mother went home with John & Hatt. 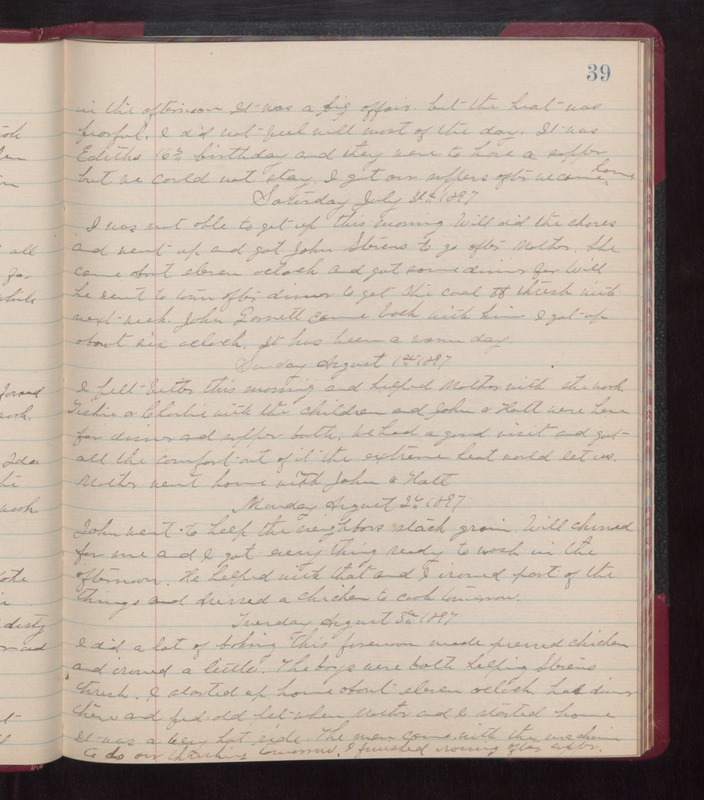 Monday August 2nd 1897 John went to help the neighbors stack grain. Will churned for me and I got every thing ready to wash in the afternoon. he helped with that and I ironed part of the things and dressed a chicken to cook tomorrow. Tuesday August 3rd 1897 I did a lot of baking this forenoon, made pressed chicken and ironed a little. The boys were both helping Stevens thresh. I started up home about eleven oclock had dinner there and fed old pet when Mother and I started home. It was a very hot ride. The men came with the machine to do our threshing tomorrow. I finished ironing after supper.